Sheaf House books are now available from Amazon through Sheaf House Direct! ​Ian and Jane Garner are Harvest Bay’s storybook couple: high school sweethearts now married for twenty years with four great kids and a beautiful home. But this storybook, like most, can’t be judged by its cover. Ian works long hours at the business he built to provide for his family, unintentionally alienating his wife in the process. Feeling unappreciated and disrespected when Jane demands more of his time, he turns to an adult website and retreats to lick his wounded pride in private. For over half of her life, Jane fulfilled her role as Ian’s wife, seldom receiving as much as she gave to the marriage. Left lonely and dying inside, she turns to her forgotten love of painting and a new friendship with a male coworker to revive the cold and dormant part of heart. As their marriage unravels, Ian and Jane begin to realize that to save their marriage, first they both need a Savior and that a threefold cord is not easily broken. But when a life or death situation occurs, is it too late for forgiveness, grace, and mercy to set them free to return to the love they once knew? 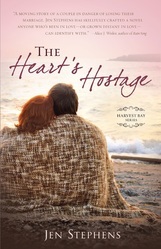 Or will they continue to be held as The Heart’s Hostage? Trade paperback, 5.5” x 8.5"
Three years after Kate Sterling’s heart was shattered by the unexpected death of her husband, home is about loyalty and practicality. So she packs up what is left of her life in Nashville, Tennessee, and moves back to Harvest Bay in north central Ohio with her young daughter. Expecting her hometown to be the same sleepy little community she grew up in, she soon discovers that some things have changed. It isn’t until she suffers another devastating loss, however, that she finally understands that the One who loves and cares for her has given her a second chance at love. But is God leading her to a love linked to the past . . . or to one who will walk with her into the future? Which road will Kate take on The Heart’s Journey Home. Trade paperback, 5.5” x 8.5", 384 pp. After two years of trying without success to have a baby, Elizabeth Truman learns that her husband may already be a father. Her increased desperation to have a baby of her own causes her to choose a path of deception. When it dead ends in despair, however, she questions both her faith and the faithfulness of the Lord. Amy Beauregard arrives in Harvest Bay with her ten-year-old son, harboring secrets that could destroy her chance at happiness and the conviction that God has long since abandoned her. But while she picks up the pieces of her shattered life, things start to fall into place that she couldn't have predicted. Will their renewed faith be strong enough to lead them through another crisis—or will The Heart's Lullaby be left unsung? Jennifer Stephens grew up in a small Ohio town where she developed a passion for writing at an early age. She majored in elementary education at the University of Toledo and for many years lived in the Nashville, Tennessee, area. She currently resides with her two daughters near her hometown, where she teaches at an elementary school. For these uncertain times, an inspiring story of grace, hope, and healing. As on that holy night so long ago . . . in a world torn by sin and strife . . . to a family that has suffered heart-wrenching loss . . . there will be born a baby . . . In 1967 the military build-up in Viet Nam is undergoing a dramatic surge. The resulting explosion of anti-war sentiment slices through generations and shatters families. In the quiet bedroom community of Shepherdsville, Minnesota, the war comes home to Frank and Maggie McRae, whose only son, Mike, is a grunt in Viet Nam. Frank despises all Asians because of the horrors he witnessed as a young soldier fighting the Japanese in the South Pacific during WWII, and especially because of his brother’s brutal death in a Japanese prisoner of war camp. So when Mike marries Thi Nhuong, a young Vietnamese woman, Frank ignores the pleas of his wife, Maggie, and daughter, Julie, and disowns his soldier son. At the same time Frank desperately bargains with a God he hardly knows for Maggie’s healing from cancer. When Frank's world is ripped apart, he is forced to confront the ugliness of his hatred in an unforgettable moment of truth. What happens next is nothing less than a miracle. Trade paperback, 5.5” x 8.5", 280 pp.